How effective is JointEase Plus? How has JointEase Plus helped others? What does JointEase Plus contain? How do I use JointEase Plus? How long does a bottle of JointEase Plus last? Joints are the areas where two bones meet such as the knee, hip, shoulder, elbow or even the small joints of the fingers, toes, neck and vertabra. Joints allow our bodies to move in many different ways – to bend and be flexible, as well as to perform everyday routine tasks, like walking, sitting, writing and even turning our heads to see where we are going. Without our joints, our skeletons would be stiff and inflexible and life as we know it would be virtually impossible! All joints are cushioned by a substance called cartilage. Cartilage acts as a ‘shock absorber’ to prevent the bones in our joints from grinding together and wearing down. There is also a certain amount of fluid present in joints to keep them well-oiled and free moving. In the course of every day activities, our joints are subject to a great deal of strain and stress. While they are designed to cope with this, it also makes sense to do all we can to keep our joints in tip-top form and to support joint health and movement. The best way to do this is to maintain a healthy lifestyle, including a diet high in essential nutrients and low in processed foods, additives and sugar. Avoid excessive caffeine which can leach nutrients from the body. Regular moderate exercise rather than sudden bouts of activity will also help to keep joints in good shape. Choose joint friendly exercise like swimming and yoga and practice stretching exercises to warm up muscles rather than putting strain on the joints. Natural remedies have been used for hundreds of years in traditional medicine to support joint and muscle health and to keep joints moving as they should. JointEase Plus means FREEDOM! Those who suffer from arthritis and other muscular skeletal problems will yearn for freedom from pain and freedom to walk and move with ease. JointEase Plus contains 100% pure Harpagophytum Procumbens, also known as 'Sengaparile' , 'Devil's Claw' or 'Duiwelsklou', because of the claw-like shape of its fruit. For thousands of years, the Khoisan people of the Kalahari Desert (in Southern Africa) have used Devil's Claw to treat painful joint conditions and other health problems. Our new and even more powerful formula now combines Devil's Claw with Glucosamine sulphate and Boswellia serata, both in the forefront of latest developments in the natural treatment of inflammatory joint and muscle conditions. (see more on these new ingredients in the 'Ingredients' section on the left hand menu). Clinical studies have demonstrated the effectiveness of Devil's Claw in treating joint conditions like osteo-arthritis, fibrositis, rheumatism and small joint disease, (Lecompte & Costa, 1992). It has also been scientifically proven to assist in the treatment of lower backache (Chrubasik, 1996). In a study by Brady et al, (1981), serum cholestol and uric acid levels were shown to be reduced after treatment with Devil's Claw. Scientific studies have also indicated that it is effective in stimulating the lymphatic system to increase resistance against disease. Glucosamine is naturally manufactured in the body and scientists known that this simple substance is found in relatively high concentrations in the joints and connective tissues, where its function is to repair cartiliage and maintain joint mobility. Boswellia has been used for thousands of years as a natural anti-inflammatory. Modern science has verified that boswellic acids contained within the herb can block the formation of leukotrienes, the immune cells responsible for inflammation, while also promoting the formation of free radicals. With regular use, blood supply to the joints is also maintained, keeping soft tissue nourished and viable. I am 63 and from the day I retired at age 55 I have suffered from osteo-arthritis. My medication would have to be doubled to ease the pain at present, instead I spoke to my friend's wife, who is a Clinical Psychologist, Michele Carelse. Michele recommended Joint Ease Plus. After 3 - 5 weeks there was a difference. Now my joints feel stronger and I have less pain. Thank You." "I am 69 and for the past 5 years have suffered from lower back pain and painful knees so that I was sometimes bent almost double and felt like I was at least 20 years older than I really was! I took JointEase quite sceptically after it was recommended by a friend, because I have not had much experience with herbal products. After 3 - 4 weeks I could really feel the difference. Now about three months later I am taking a half dose and am walking upright again for the first time in years. My compliments on a very effective product, which helps more and is a fraction of the price of other medicines. I am walking proof that it works!" "JointEase Plus has saved my life! Instead of constant pain, I can move around and begin to enjoy life again. I notice that your new formula relieves the pain AND I can move better. My joints just seem to move more smoothly and my lower back pain has disappeared without trace for the past three weeks! To me it is unbelievable as I thought I would have to put up with this for the rest of my life. I simply cannot thank you and your team enough!!!!!" Harpagophytum Procumbens (Devil's Claw) This herb is indigenous to the Kalahari Desert and is exclusive to Africa. Because of its powerful anti-inflammatory properties, Devil's Claw is used world-wide for osteo-arthritis, fibrositis, rheumatism, small joint disease and lower backache. Scientific analysis shows that the most important active ingredients in Devil's Claw include monoterpine, harpagoside, glycoside, beta-sitosterol, procumbine and stigmasterol. Warning: Because of its strong anti-inflammatory properties, JointEase is not recommended for people with stomach ulcers or those with any heart conditions, unless supervised by a medical practitioner. Glucosamine sulphate Glucosamine sulphate is one of the best bio-available forms of glucosamine supplements and it has been shown that 90 - 98% is readily absorbed in the intestines. Glucosamine has been approved for the treatment of arthritis and other joint and muscular conditions in more than 70 countries throughout the world. Studies have demonstrated its ability to decrease pain and inflammation, increase range of motion and to help repair aging and damaged joints in the hands, knees, hips and spine. Recent studies have suggested that glucosamine may be even more effective than the nonsteroidal anti-inflammatory drugs (NSAIDS) such as aspirin and ibuprofen, without the harmful side-effects associated with these drugs. It is well known that while the NSAIDS may mask the pain of arthritis and other joint conditions, they can also impair the body's ability to produce cartilage, thereby worsening the condition in the long run and increasing dependence on anti-inflammatories. In contrast, glucosamine relieves pain and inflammation, while also building and repairing cartilage and connective tissue thereby going far beyond pain relief. Boswellia serata Extracts of the gum of this tree found in India have been used for thousands of years to relieve pain and inflammation. Scientific studies have demonstrated that boswellia has the ability to inhibit pro-inflammatory mediators in the body and to reduce pain and inflammation without irritating or ulcerating the stomach lining. Boswellia has also been shown to be beneficial in the treatment of ulcerative colitis. Initially take two tablets three times daily after meals for approximately 3 - 5 weeks. Once relief is obtained, dosage can be reduced to one tablet twice a day after meals as a maintenance program. Safety during pregnancy or breastfeeding has not been established. Not recommended together with Warfarin or other anti-inflammatory medication. While almost immediate relief is sometimes noted, it is more common that gradual improvement is noted over a period of about 3 - 6 weeks. 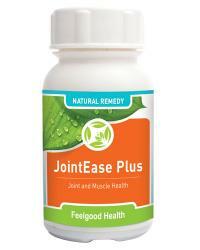 One bottle of JointEase Plus (60) tablets will last 10-30 days depending on dosage. Happy Joints Pack: Soothes inflammation and arthritic joints!